« Biennale-Sessions_2018/6-8JUL: Through the scenic body. Mariangela Melato. Without words. The main idea of our project is to put a stage inside the core of the former Castellavazzo cement factory complex, which are the three giant, concrete, cylindrical storage silos nine metres in diameter twenty metres high. We cut them horizontally to put the stage in it. The cuts were made in the way, that parts of the theatre were provided with a different perspective view following the lines of sight of the auditorium. We mostly deleted all the other existing buildings to focus on this part of the building. Emphasizing this with a new structure called Black Box covering the main architecture and shelter the most important part inside. The third important part is the mentioned audience space, from where the spectators are able to watch to both stages of the project. Entering through the gate of complex, the first element that attracts the audience`s attention is a manifesto of the building: the concrete tubes used to produce the concrete mixture. Walking forward they will enter in a little hall with the ticket office and the bar on the right. At this point they are free to choose either to enter inside the Black Box or going outside of the building to reach the outside stage with a water surface. The Black Box is the coffer of the actors’ house and the performance space. It stands for the conceptual idea of the exhibition space: when the light is off you are standing in the dark and you cannot understand what happens around you. This magical moment precedes every performance. Than some lights turn on and you start to draw in your mind the kind of space that it could be. The metal curtains are additions to the subtraction of the parts of the silos. They are the dynamic element of the stage area, complementary to the static essence of the silos. The curtains work also with the feelings of the audience trying to put uncertainty and misunderstanding on the performance space. They do not allow you to measure the dimension of the space and they create a continuous vortex around the silos as well as new forms of stage situations. The stages are fixed onto the surface of the silos creating minimal space for performance. They are designed with the intention to emphasise the height of the silos and concentrate the action space in a small portion to give more tension to the acting moment. The actors can move freely inside the Black Box. The shows can take place at the same time in different places: on the stages, on the stairs, inside the scaffolding and outside the Black Box in the water. These infinite possibilities for the acting allows infinite variations to the same scene. A forth “silo” is the staircase, connecting the whole living space. The living space, designed on the west side, starts from the first floor where there is the changing room and arrives to the fifth floor with the bedroom. The “outside stair” is the only opportunity to reach the different levels, putting the actors directly on stage during their private life. The whole living space is a continuous passage from a more public to a private space. Actors have the possibility to move directly inside the scaffolding, in the audience space and use it as an addition space. The windows are completely integrated to the Black Box. When they are closed they create a unique facade, but when they are open they are showing life of the actors outside and bringing the architecture to life. There are also opening in the wall that stands between the silos and the living space to create a strong connection among these two spaces. 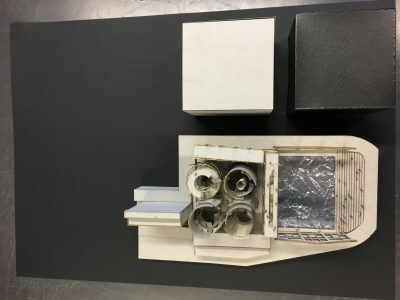 This entry was posted on Friday, July 6th, 2018 at 6:11 am	and is filed under Biennale of Venice, students' work.